Urban glamping is offered in this vintage-style caravan on the roof of a boutique B&B in Bristol city centre. Parked up in the roof-top garden of our boutique B&B, Brooks Guesthouse Bristol, the 16ft Rocket is our smallest Rocket caravan. It's a cosy, comfortable little hideaway - with Bristol roof-top views! Custom-built in Worcester, this rooftop rocket was actually winched in to its place in the compact astro-turfed roof-top garden alongside three others. The 16ft Rocket is perfect for a couple with a 4ft 6ins double bed at one end and a small seating area at the other. 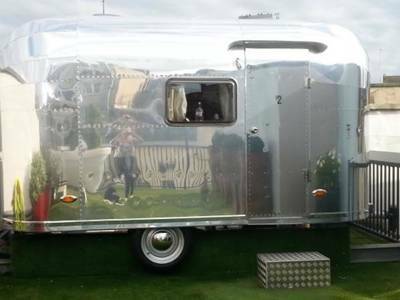 These vintage-style trailers, modelled on the iconic American Airstreams, use clever caravan technology to incorporate everything you need for a city-centre stay including a compact bathroom with a Hans Grohe Eco shower, hanging space, built in chest of drawers and bag storage. You'll also have the mod cons you'd expect from a room in a boutique B&B including a flat screen TV with built-in DVD player, a Retro Roberts radio, tea and coffee making facilities, fluffy cotton towels and toiletries. This is city centre glamping at its finest!